There is a dangerous side to hoarding especially when it involves animals. All too often people who were suffering from this type of obsessive-compulsive disorder use animals as their “collectibles.” Too often there are news stories about homeowners living amongst dozens of cats, birds, dogs and in extreme cases rats. These types of hoarders don’t even realize they are causing great harm to these animals. It only takes the intervention of authorities to rescue the animals and make sure that hoarder deals with their psychological issues. 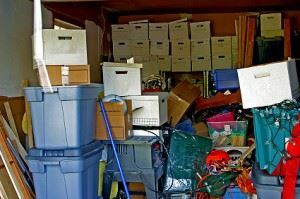 Fortunately, most of us have only slight hoarding tendencies which have more to do with our own issues of convenience as opposed to some type of disorder. But that doesn’t mean our own hoarding can’t get out of control. It’s important to nip hoarding in the bud, so to speak, before it gets out of control. An amateur hoarder is someone who has no trouble throwing things away; it’s just that they are a bit of a procrastinator when it comes to cleaning up. Often it easier for these types of people to stuff something in a drawer or closet instead of getting rid of it. Of course, it doesn’t take long before those drawers and closets are overflowing with junk that can simply be tossed out. The same holds true for entire rooms in our homes. It’s not uncommon for people to use a space like a garage or basement as a kind of hoarding zone where everything that’s not being used is placed. Hoarding experts will tell you that if you don’t use something at least once every six months you should throw it out. This means clothes, shoes, magazines and anything else that is taking up space in your home. Even that pasta maker you got as a gift for Christmas three years ago could be considered junk if you’re never going to use it. You could de-clutter your home by adopting the “bin method” of organizing. This will have you putting the items scattered around your home into one of those big plastic bins which can then go on a shelf. While that does help clean up the clutter it might turn you into a bin hoarder! And that type of organizing only really works with small objects. A strong approach to curb your hoarding tendencies would be to hire Junk King San Antonio. These are the San Antonio-based professional junk haulers who are extremely experienced in removing all kinds of junk and clutter from a home. Suppose you schedule an appointment with Junk King to show up at your house two weeks from this coming Saturday. That gives you 14 days to go through your home and identify every item you’re ready to let go of. Once you’ve made those decisions all you’ll have to do is tell the Junk King crew what they need to take away. Within a matter of hours you’re home will finally become free of clutter and no one could ever accuse you of becoming a hoarder! This entry was posted in Hoarding Clean Up, San Antonio Junk Pickup, San Antonio Junk Removal and tagged Get Rid of Clutter San Antonio, Junk King San Antonio, San Antonio Hoarding Help, San Antonio Junk Removal on February 29, 2012 by Mike Hasselbalch. Last updated August 2, 2017 .